A 36-year-old man has been arrested after a house was surrounded by armed police investigating reports that a man was inside armed with a crossbow. 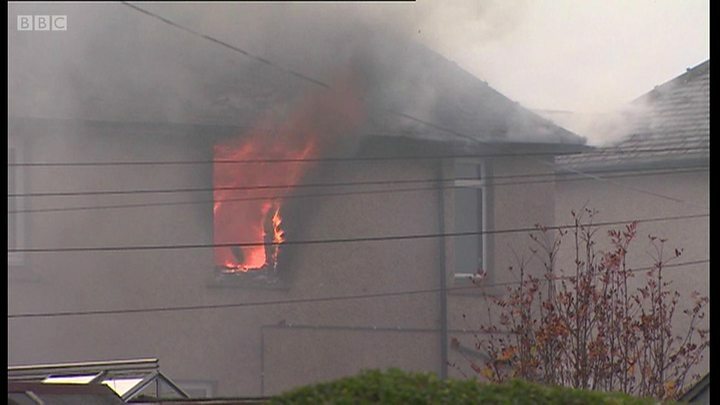 Flames were seen coming from the roof of the property in Morris Crescent, Blantyre, shortly before the arrest was made. A woman was also inside the house, but was not thought to be there against her will. Firearms officers and negotiators were called to the incident at about 11:00. Nearby schools were also alerted and told to keep the children inside. Ambulances and a police helicopter are at the scene. Police Scotland said the 36-year-old man had been arrested and was detained in police custody in connection with the incident. A force spokeswoman added: "A woman has been checked over by ambulance staff and the fire service are at the scene and are currently working to extinguish fire within the property." The force earlier deployed firearms officers, negotiators and uniformed officers to the scene. The Scottish Fire and Rescue Service said three fire engines had been sent to the incident after being alerted at 11:30.